I swear, at least 50% (or more!) of my US Air flights are delayed or cancelled and tonight is no exception. We're delayed 1 hour out of Boston going to Philadelphia where I'm connecting out to Minneapolis. My connection is delayed also so they're saying I'll make it. I'm very much hoping so - I'm speaking to the local meeting of the Community Health Charities in the morning. Fingers crossed. My 5:40PM departure in Boston to Chicago is now a 7PM departure. But helpfully the gate agent is telling us it'll probably be 'much' later. I'm flying from Austin to Houston yesterday. Single leg flight. About a half hour in length. And I arrive at the airport in Austin two hours before the flight. So naturally Continental lost my bag. No idea where it is. None. So, no shave this AM. No clean clothes. And a big meeting with The Houston Chronicle and a number of prominent local nonprofits. You'll be able to recognize me…I'll be the one in the chino's and shirt from yesterday. Photo_031408_001, originally uploaded by Middlesex Fells. 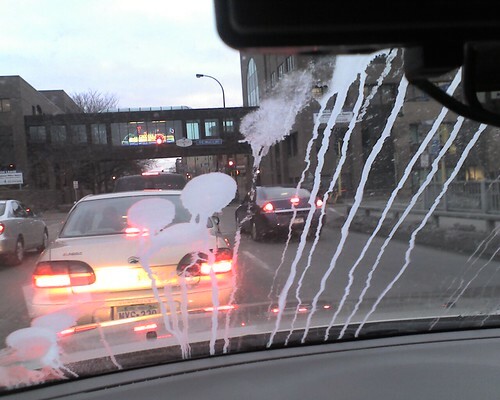 When the hotel valet brought my rental around Friday morning in Minneapolis the windshield (and most of the car) was covered in a bizarre substance that wouldn't wash off. Couldn't be scraped off. It made for interesting driving. 08-03-05 Boston to Atlanta to DC to NYC, originally uploaded by Middlesex Fells. Down to Atlanta first thing Wednesday morning for nonprofit meetings. Then to DC for Thursday nonprofit meetings. Then to New York City on Friday for nonprofit and media partner meetings. Plus, I'm speaking to a class of graduate students at NYU - very cool! 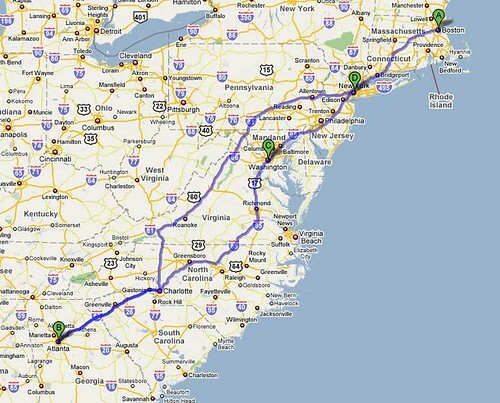 And I get to take the Acela twice - DC to NYC and then NYC to Boston Friday evening. Love taking the train. Hate taking the plane. When you fly as much as I do. Picture 536, originally uploaded by Middlesex Fells. You're bound to miss a flight or two. And I missed one today in Orlando. By two minutes. Now, two hours to kill before the next flight to Boston. 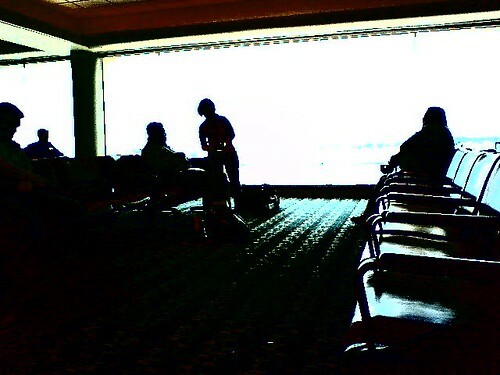 Enjoy the stylized view from Gate 55 at Orlando International. I know I am. 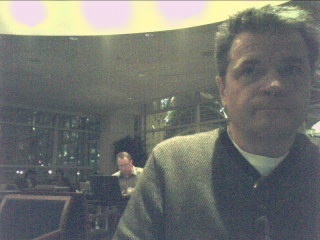 Killing time in the Admirals Club waiting for American to completely hose me. My 6PM was delayed to 7PM. Wait. Till 7:15PM. Wait. Till 7:30PM. Wait. Till 8PM. Wait. Till 8:15PM. At least this is what they're saying now. I am so not a bug person. I am so not a bug person., originally uploaded by Middlesex Fells. So. If you know me...you know I'm not a big fan of bugs. I'm not crazy about it. I'm just not thrilled with them. I know they're important to the environment and everything. I'd just prefer they weren't around me. And I'd really prefer they weren't in my hotel room. And I'd really, really prefer there weren't a whole bunch of them in my hotel room. 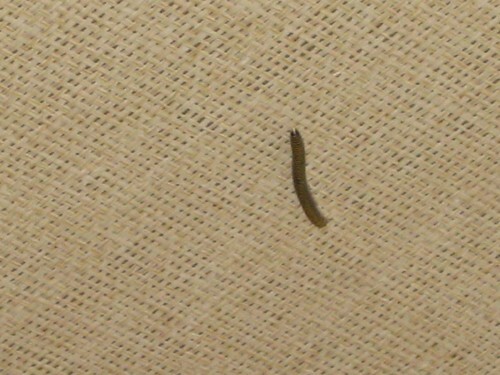 So imagine my delight when I woke up this morning in Miami at The Standard (a hip, cool and surprisingly bug infested hotel in Miami Beach) and found a 1/2 dozen or so of these delightful creatures crawling on the walls, ceiling, and in the bathroom. They're about 1.5 inches long and move surprisingly quickly. Though not as quickly as I did in getting out of that place. Sigh. More joys of travel. Windows Vista. Palm Treo 700P. Twin products from HELL. Don't buy Windows Vista. Don't. Don't. Don't. Don't buy a Palm Treo 700P. Don't. Don't. Don't. These products are complete crap. So not ready for prime time. Foisted off on an unsuspecting public. Why post this now (or again)? Yet another series of crashes...at the most inopportune times. Why does American Airlines hate me? My American flight to San Francisco is leaving at 6:30PM Monday night (had to fly in the night before because I have a full slate of meetings in SF on Tuesday). Now it's leaving at 7:20PM. Now the plane is being taken out of service and we're going to be moved to a new plane that will depart...wait for it...at 10PM (Boston time). I'll be in bed in SF at the equivelent of about 5AM/Boston. 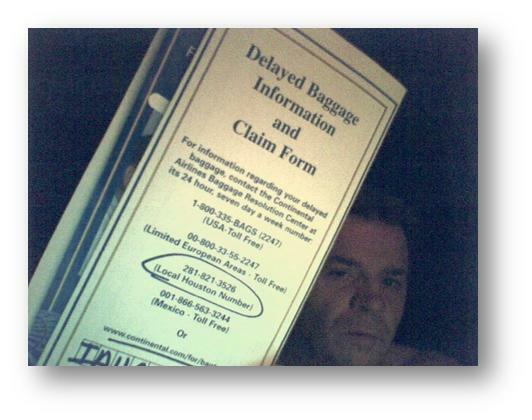 You'll remember that American left me high and dry in Chicago resulting in this post.